Chicago: 1/20/18 Women’s March to the Polls! “Skin Suit”: @ARC Gallery. art for a reason. We see through the transparent cover-up. “Skin Suit”: @ARC Gallery. art for a reason. We see through the transparent cover-up. We Believe the Women. In Solidarity. Resist. ALL POLITICS ARE LOCAL: Chicago Art Says… Feb 1, 2019 opening.. come=engage! ALL POLITICS ARE LOCAL is a collection of 23 artworks featuring works from 14 different artists. All artworks reference the important issues that our upcoming mayor will soon face. Between the ousting of Ed Burke and alderman elections, Chicago really has a chance to choose how it proceeds into the future. Even on a national level all issues have a local consequence, but local politics are the first step in a path to national influence. ALL POLITICS ARE LOCAL, runs February 1, 2018 – March 3, 2019, with an artist’s reception, Friday, February 1, 2019 from 6:00-10:00 pm. The Jackson Junge Gallery presents ALL POLITICS ARE LOCAL, its first group exhibition of the 2019 season. The exhibition features 23 works of art in various mediums by artists from all around the United States. The opening will be hosted on Friday, February 1, 2019, with an artist’s reception from 6:00 – 10:00 pm. Admission is FREE to the public. It has been claimed that all politics are local. The Legislated and Executive branches of the United States government are currently at a standstill and numerous Americans are wondering what the future of our great country will be. Many of the current national issues are relevant to the citizens of Chicago, a city that is both known for its great leaders and “windy” politicians. In September of 2018, Rham Emanuel announced that he would not be running for re-election as Mayor, shocking the citizens of Chicago. A record-breaking number of 15 candidates currently have put their names on the ballot. The prospect of a new Mayor is always an exciting one. The upcoming change of leadership will address and stir the debate about what is best for our great city. This exhibition touches on subjects including the current outlook of the United States, unlawful incarceration, Black Lives Matter, gun control, police brutality, women’s rights, the environment, immigration, big business development, and LGBTQIA rights. 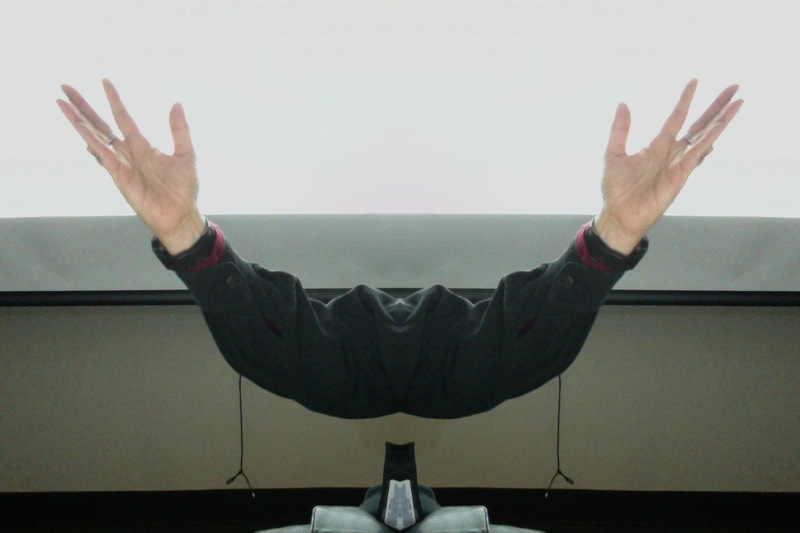 ALL POLITICS ARE LOCAL runs February 1, 2019 – March 3, 2019 and is curated by Gallery Director Chris Jackson, Assistant Gallery Director Kaitlyn Miller and Gallery Assistant Jordan High. preview by clicking below on red. yes. I see red. NEW Era for CAN TV. “The Peoples TV” is here! People of Chicago, are you READY? See you on TV! CAN TV’s (Chicago Access Network TV) finally has a new home and it is impressive! It has been a long struggle to get its own building and it has been worth the wait. Be part of the equalization of TV, come for the access, and share/add your voice to the grand diversity that makes Chicago! Shout out welcoming, to individuals, community groups and nonprofits all over Chicago. I recently visited the brand new location now located in the Illinois Medical District Area at 1309 S. Wood St. between Damen and Ashland. It is easy to park in the free CAN TV lot, which is accessible off 13th Street, and there is also plenty of metered street parking. Public transportation via CTA bus and train lines with stops that are a short distance away. It is oddly quiet and almost with a rural feeling. Then you see the elevated and skyline in the distance…Admittedly, it has been a while since I connected with CANTV and it was like a reunion. I was one of the first certified indie producers back in 1986. I have continued over the years to show my artistic and social films in this incredible venue. I started shortly after my MFA from the School of the Art Institute, back when video was difficult, expensive and heavy! I have stayed with CANTV over the years and watched the changes. Ah, history! At my arrival, Hugs all around with Barbara, ( New City Film names CAN TV Executive Director Barbara Popovic one of Film 50 2015: Chicago’s Screen Gems, “the creative thinkers, and more importantly, doers” representing “action and movement in every form of Chicago media.”) and Lesley Johnson, Program Director, Mary M. Stack, Assoc. Executive Director. and thanks to Joe Szentivanyi, Cable/Traffic Coordinator and Joe Garcia, Network Administrator.with a shout out to all the other good people there for many years, like Greg Boozell, Technology Director, (who I missed seeing in person-very busy guy) and fellow SAIC Alum. They all seem exhausted, leaner and even more determined – if that is possible – with the move this last yr from the Green St./Halsted area. The full switch from using videotape to all digital will be a leap for some to make. But as you know, digital media affords current technology and many benefits. The staff who works here are passionate and educated and highly dedicated about what they do and always most helpful. I got a quick tour of the facility, which is in the final stages of “getting ready” With boxes still unopened, and everthing with the “ fresh smell of media” you can see what lies ahead is nothing short of game-changing for the people who will use it. Growing pains are part of the process, and now the final push to get it all fully ready. Cablecasting accepting contact for programs now.. but always Call ahead, (no doorbell yet, so bring your cell to call for entry 🙂 (smile) and check out the website for more information. (yes, I have a “special” in March…stay tuned!= yes…maybe you can guess what it will be…) (And..Chris Drew, Street Artist and Deborah Drew BOTH spent many years with community interactions on CANTV on the “Hotline” for social justice and free speech issues) ok, a hint..coming soon to CAN TV! American Indian Center of Chicago-4/30/15.thurs 6pm: Special Screening of “Chris Drew-Free Speech” Film! American Indian Center of Chicago-4/30/15.thurs 6pm: Special Screening of “Chris Drew-Free Speech” Film!. “…you say you want a Revolution?” FREE SPEECH permit may be required in Chicago! 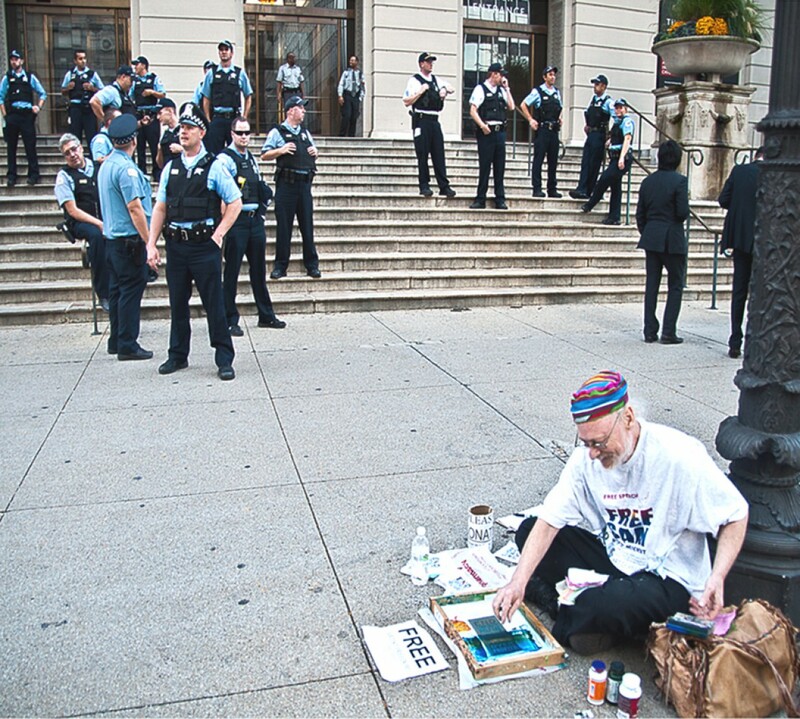 Chris Drew, Street Artist (1949-2012) who for 25 years as an artist and founder of the Uptown Multi-Cultural Arts Center was trying to create a vibrant art scene in Chicago, especially downtown, where selling art is prohibited in the most viable locations without a “FREE SPEECH PERMIT”! Hey, the New Illinois Eavesdropping Law is Back! Verified by the man who was arrested over 40 times..and won! so locally this is a non-issue. – Robert Lederman – Jan 2014. “NEW” Law pending: Citizens Recording Police -Once again a Felony? Citizens Recording Police – Once Again a Felony? Current news on the “NEW” version of the Illinois Eavesdropping Law now sits at Gov. Quinn desk for either Veto or Signature. Just when we thought it was over.. In March the Illinois Supreme Court unanimously overturned that state’s draconian Eavesdropping Act, finding that it “criminalizes a wide range of innocent Conduct.. According to IllinoisPolicy.org, the bill discourages people from recording conversations with police by making unlawfully recording a conversation with police – or an attorney general, assistant attorney general, state’s attorney, assistant state’s attorney or judge – a class 3 felony, which carries a sentence of two to four years in prison. Meanwhile, the bill makes illegal recording of a private citizen a class 4 felony, which carries a lower sentencing range of one to three years in prison. An important documentary about street artist Chris Drew, and his challenges and victory defending First Amendment rights for all citizens, especially Artists. 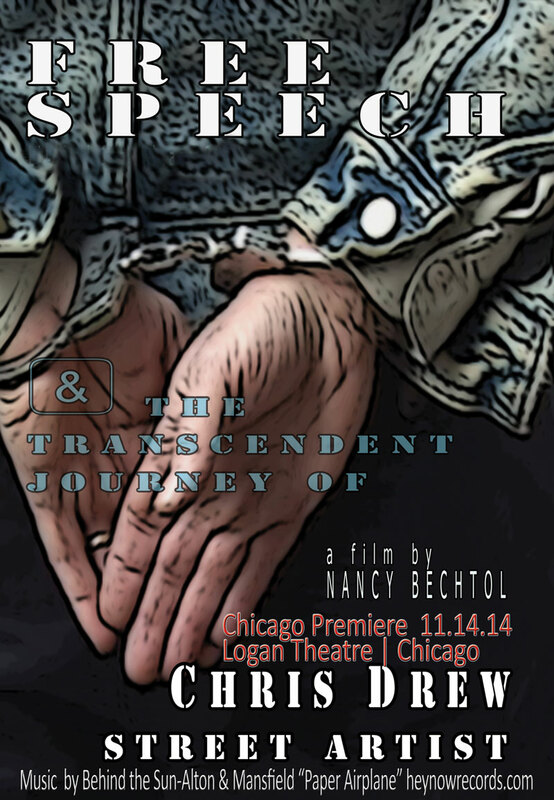 Chicago premiere at The Logan Theatre on Friday, 7:30pm November 14. 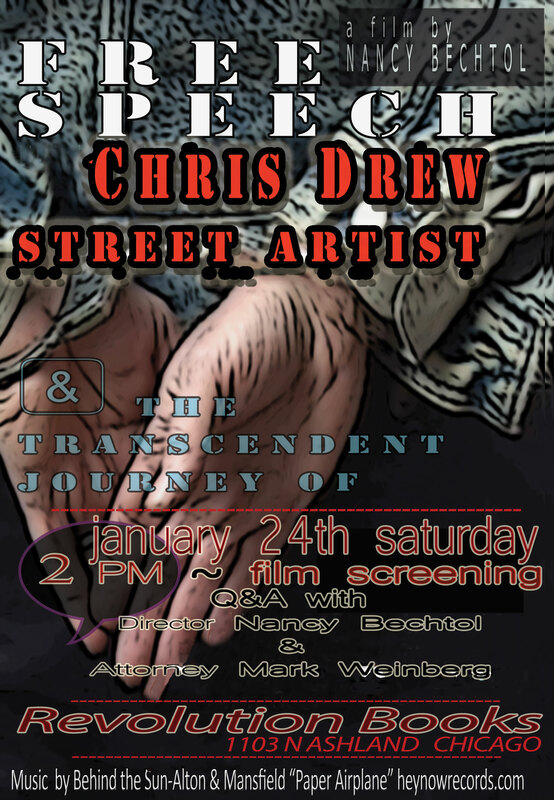 The film, Free Speech and the Transcendent Journey of Chris Drew, Street Artist is a film by Nancy Bechtol. Literally thousands of people across Chicago know Chris Drew, because of his vibrant presence in Chicago’s art community. Original Music featured in the film is courtesy of Hey Now Records. http://www.heynowrecords.com “Paper Airplane” by Behind the Sun` Andy Alton & David Mansfield. Diana Berek: Artist, Board Member with UM-CAC, Uptown Multi-Cultural Arts Center, Keyholder of Mess Hall, Occupy Rogers Park, Planning Committee of The Glenwood Ave Arts Festival. Chicago. He (Chris Drew) wanted the City to re-examine the Harold Washington (Cultural) Plan. To de-centralize culture and bring it back into the neighborhoods. To de-centralize not only the initiatives, but the budgeting.